The Trichilia emetica is a majestic evergreen hardwood that is indigenous to Southern Africa and can be found in KwaZulu Natal, all the way through Swaziland, Mpumalanga, Limpopo and up through northern tropical Africa. This large tree is just as impressive as its many names. Also known as the Natal Mahogany, Cape mahogany, rooiessenhout, umKhuhlu, mmaba and mutuhu (to name just a few) – this tree is considered a definite asset to any property. The Trichilia emetica works beautifully as shade tree with its attractive and thick, dark foliage forming a large, dense crown all year round. From around October to December, you can find creamy-white flowers amongst the glossy leaves. The tree is also known for its fruit, appearing between January and May, with round velvety pods containing 6 perfectly packaged black and bright red seeds, fondly known as ‘lucky beans’ to some South Africans. 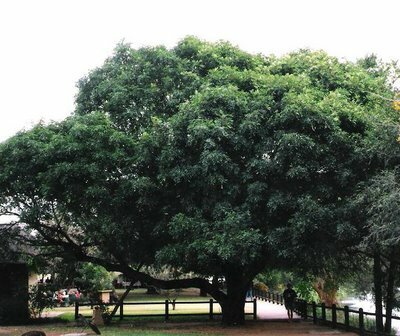 Not only a shade tree, the Natal Mahogany does a good job as a feature tree, filling up space well in a large area, such as parks or wide streets. With time, this tree can reach an imposing stature, providing a secret world of natural beauty for insects, animals and people alike. The root system is not invasive, making it a good option for urban areas. In Durban it has been adopted as a popular street tree as its thick branches cool down streets and cars alike. As you can see below on the left, a line of young Natal Mahoganies beautifully frame a section of Durban’s Umhlanga Rocks Drive. 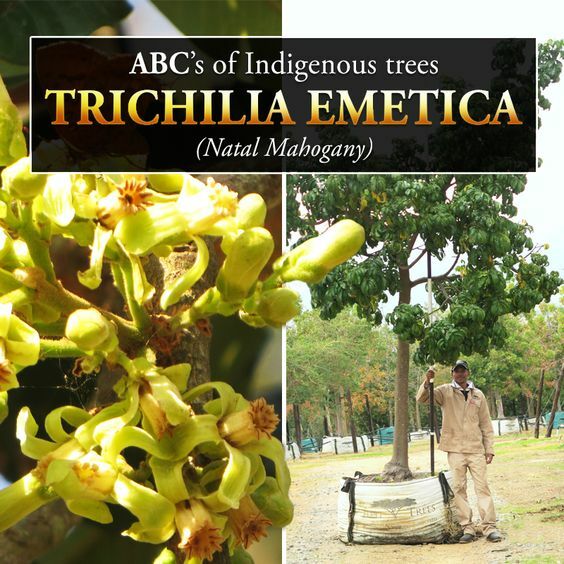 But the Trichilia emetica is not only known for its landscaping uses; it is a nature enthusiast’s dream, as this beautiful species attracts a wide variety of birds, butterflies and insects that make their homes in its branches. It is also an important medicinal plant and its leaves, bark, seeds, roots and oil have been used to treat a wide variety of ailments. This tree flourishes best in a sunny or semi-shaded area. It needs to be well-watered and does not tolerate frost very well. However, it is an incredibly fast-growing tree and when mature, tolerates drought very well. 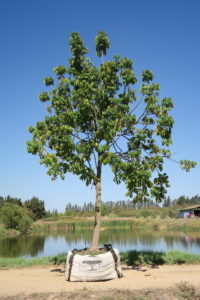 We currently stock 40L, 100L, 200L and 1000L of this tree – head to our website to find out more if you’re interested in using this tree for one of your landscaping projects!